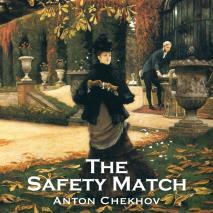 The Safety Match is a short story by Anton Chekhov first published in English in 1922 as part of the collection The Cook’s Wedding and Other Stories. The Safety Match is a true locked room mystery with a surprise ending. A retired police officer is missing from his room and believed to have been murdered, but the body cannot be found. It appears the killer entered the room through a window and that the dead man was taken from the room through the same window. Suspects are his sister, his mistress, his butler, and his manager who reported the murder. As usual Chekhov will sursprise us with an unexpected ending. Total Running Time (TRT): 46 min.